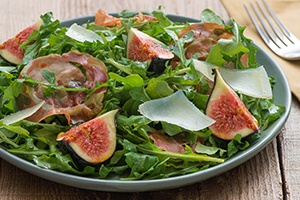 The secret ingredient in our Arugula and Fig Salad? Crisp pancetta. It adds a nice bit of texture and salty goodness. See how easy it is to make your own in just seconds. All you need is some thinly sliced pancetta and a microwave. Experiment by adding it to other dishes too. This versatile ingredient can be a tasty addition to pastas, sandwiches and more. Now it’s time for the crisp pancetta. Here’s a quick and easy way to make it yourself in the microwave. Lay the pancetta on a plate lined with a paper towel and cook on high for 30 second intervals until crisp. Place it on top of your salad and it’s ready to serve.